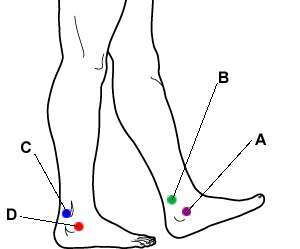 There are the acupressure points for relieving Ankle Problems. Working on these points can help you get better quicker. You do not have to use all of these points. Using just one or two of them whenever you have a free hand can be effective. Location: One thumb width below the inside of the anklebone. Benefits: Relieves swollen ankles, as well as heel and ankle pain. Caution: This point is forbidden to be strongly stimulated after the third month of pregnancy. Location: In the hollow midway between the protrusion of the inside anklebone and the Achilles tendon, which joins the back of the calf to the back of the heel. Benefits: Relieves swollen feet and ankle pain, and strengthens the ankle joint. Location: Opposite Points B , in the hollow between the outer anklebone and the Achilles tendon. Benefits: Relieves swollen feet, ankle pains, thigh pain, rheumatism in the foot joints, and lower back pain. Location: In the first indentation directly below the outer anklebone. This hollow is one-third the distance from the outer anklebone to the bottom of the heel. Benefits: Relieves heel pain, ankle pain, insomnia, and general foot pains.